Albatrosses on the way out....? The albatross, the world's biggest seabird, has suffered another sharp decline in numbers, increasing pressure for it to be placed under international protection. Albatrosses and their smaller cousins, the petrels, are being killed in huge numbers by commercial fishing boats that trail long lines carrying thousands of baited hooks. 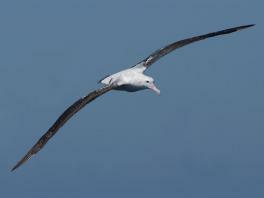 This week experts will meet at the Royal Society in London to discuss the crisis, which has seen a 63 per cent decline in the albatross population on an island in the South Atlantic. Next month several nations will also meet in Hobart, Tasmania, to try to reach an international protection agreement. Dr John Croxall, the head of bird research at the British Antarctic Survey, based in Cambridge, said: "Our studies show these magnificent birds are in serious trouble and it is hoped positive measures to safeguard them can be developed." During the latest nesting season, the black-browed albatross (Diomedea melanophris) population on Beauchene Island, one of the Falklands group, was down to 101,000 pairs, from 160,000 pairs in the early Eighties. Similar declines have been noted elsewhere. 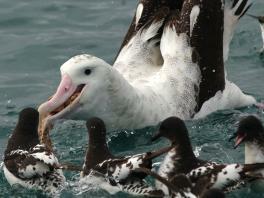 Studies on Bird Island in South Georgia, found that 1,500 out of a population of 22,000 black-browed, 500 out of 20,000 grey-headed (D chrysostema) and 45 out of 4,000 wandering albatrosses (D exulans) fail to return each year, and that the longliner operations are the chief suspect. Euan Dunn, marine policy officer for the Royal Society for the Protection of Birds, said: "There are very real fears that if this crisis is not overcome there will be big population crashes, with maybe 20 species facing extinction. "Because their breeding rate is so slow, they don't start until they're around 10 years old and larger species only produce one chick every two years, the losses caused by the longliners are unsustainable. There is no way they can compensate for the increased deaths. "At one time a population of 1,000 pairs of albatrosses might raise 500 young in a season and 200 of those would survive to breed. Research has shown that only about 20 are making it to breeding age, with the number of adults also being reduced by the same problem they're very much sliding towards disaster." 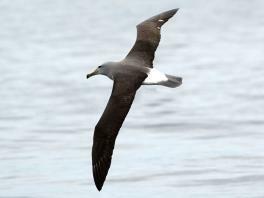 Black-browed albatrosses occasionally reach British waters, one visited Herma Ness at the northern tip of the Shetland Isles each summer from 1972 to 1994, but a species of petrel nesting commonly on British coasts, the northern fulmar (Fulmarus glacialis) is another longliner victim. Mr Dunn pointed out that it was estimated between 50,000 and 100,000 fulmars die annually through being hooked by longliners operated by the Norwegian, Icelandic and Faroese fishing fleets to the north and west of the British Isles.